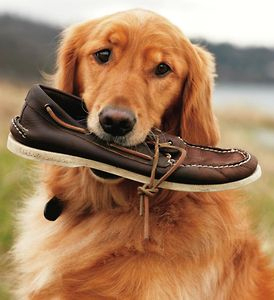 A Golden Retriever and a well worn Top-Sider. A little piece of WASP heaven. More often than not when discussing how to dress like a WASP, the conversation inevitably turns to business or other semi-formal attire. And while it’s true that knowing how to dress up properly is a key component of WASP culture, we must keep in mind that knowing how to properly dress down can be just as important. And when it comes to casual attire, there is one item in particular that no self respecting WASP should ever be without: a pair of Top-Siders. Now, I’ll be the first admit that some WASP’y attire isn’t exactly practical or cost effective. There are, for example, only so many opportunities to show off that new Madras suit and not be mistaken for a hobo… However, that’s definitely not the case with Top-Siders. In fact they’re actually one of the most practical purchases you can ever make. Why? First consider that the Top-Sider (also known as the boat shoe or deck shoe) is perhaps the most versatile footwear option available on the market today. Think about it, whether it’s in the office or on the beach, the Top-Sider is equally at home. They’re perfectly appropriate just about anywhere and for anything. Also handy is that they never go out of style. Minor variations come and go, but the basic deck shoe has remained essentially unchanged (and a best seller) for nearly 80 years. These days they seem to cycle between preppy niche item and mainstream fashionable. Either way you can’t go wrong. Rather the typical Anglo-Saxon background associated with much of WASP culture, the Top-Sider is uniquely a product of American ingenuity. 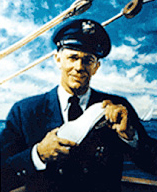 The idea for the shoe was first conceived by a man named Paul Sperry. During a cold Connecticut winter, Paul noticed that his dog Prince seemed to have no trouble running across slick snow and iced covered surfaces and became curious as to what made that possible. Upon further investigation he noticed the pattern of groves and cracks in his dog’s paws and suspected they were the secret to Prince’s superior traction. Sperry set about replicating the pattern by using a razor to score groves into a rubber shoe sole and the rest is history. By 1935 the design was refined into the scalloped pattern of cuts (like you’ll find on any pair of deck shoes today) and the Top-Sider was officially introduced. As the name implies, the Top-Sider (referring to the outer or “top side” deck of a boat) was originally introduced as a boating shoe that would allow sailors like Paul Sperry to maintain traction in even the slipperiest of conditions. The shoes proved to be highly effective and over the following decades became a WASP favorite both on and off the water; as their association with boating culture sowed appeal among the general preppy set as well. The natural element of the Top-Sider. Thanks to their uniquely designed sole, they'll maintain traction on even the slickest of surfaces. 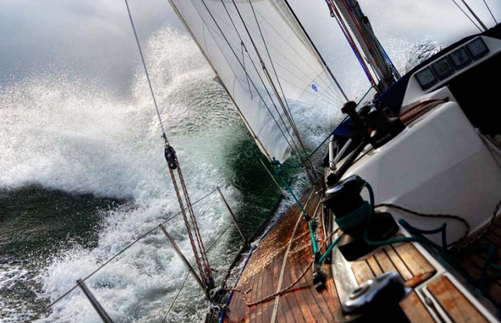 OK, so you’re on board (get it?) with the idea that you need a pair of deck shoes. Now comes the task of actually going out and buying them. My recommendation: stick with the classic. That means going with the original Sperry Top-Sider. They’re the real deal, last for years, and available everywhere. They’re also fairly inexpensive compared to many of the deck shoes offered by other brands. In terms of material I’d suggest going with the basic leather in some shade of brown or tan. For the soles stick with the basic flat rubber bottom. They don’t offer a lot in terms of support, but then again you won’t be wearing them to run a marathon… If you want to go really traditional, get the soles in white (originally designed to not mark-up decks). Although I’ll confess that I actually prefer the colored variety. 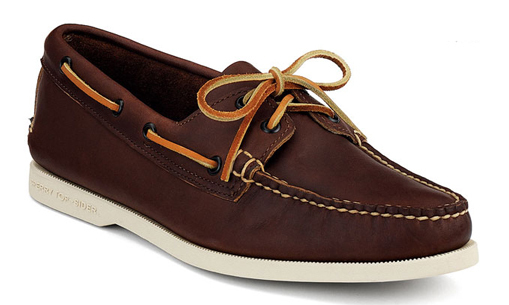 The classic version of the Sperry Top-Sider. Note the simple brown leather construction, rawhide laces, and white "non-marking" soles. If you want to go authentic, this is it. Again, stick with the classic and you really can’t go wrong. However, once you’ve got your classic pair of Sperry’s, feel free to experiment. Higher end dress models, canvas, suede, different colors, there are a myriad of options from which to choose. Just try not to stray too far from the original if you want to maintain that WASP’y image. This may seem like a no-brainer and in some ways it is. For the most part you can simply throw on your favorite pair of deck shoes no matter what you’re wearing and you’ll look fine. After all, that’s a major part of the appeal of the shoes to begin with. Like New (100-75%) – Generally when the shoes are new an pristine. They’re unscuffed, unstained, and maintain their original form. They’ve never really been exposed to water so the leather is still soft and supple. In this condition Top-Siders are best worn in nicer settings, such as the office, out on the town, or when dining at a decent restaurant. Think of them as being on par with a pair of loafers. They can be worn with socks (only with pants, please) or without. 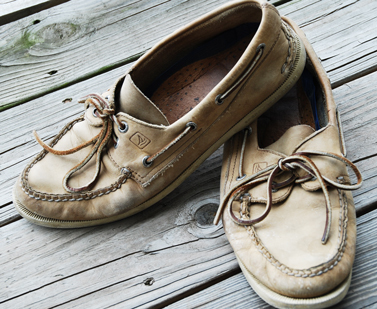 A well worn pair of Top-Siders that have seen lots of time on the water. This how deck shoes should look. Worn (75-25%) –These are shoes that have begun to show their age and/or good use. They’ll be worn, scuffed, and probably lightly stained. They’ve seen lots of sun and water and taken on a flater shape. The leather is stiffer and the seams might also be separating a bit at the tops. Near Death (25-0%) – The shoes have become heavily worn with lots of scuffs and stains, maybe even some tears as well. The laces have probably broken at some point (simply retie them together) and some of the seams have begun to open up. The shoes are severely weathered and the interior is frayed or coming apart. The soles have hardened, cracked, and no longer provide grip. The sad fact about heavily used shoes is that they all eventually wear out. Top-Siders are no different, however that doesn’t mean they’re ready for the garbage. While you can no longer wear these shoes out on the town, they are still great to have around the house for garden chores, or perhaps for use at the beach or pool. When you need a simple pair of shoes that you don’t really care about damaging or losing, these are the way to go. Once your Top-Siders have worn away to nothing, it’s time to go out and get another pair and then repeat the process. My guess is that once you get used to wearing them, you’ll be hooked for life. Even high end manufacturers now make deck shoes. This version by Salvatore Ferragamo will set you back $300. 1) If you don’t already have a pair, head out to the store and buy some. Almost every major shoe store or department store will carry Top Siders and/or other styles of deck shoes. Pricing is just about the same everywhere, but sometimes you can find a deal for $10-20 off. In general expect to pay around $70 for a pair of Sperry Top-Siders. Some brands cost less, some cost much more. 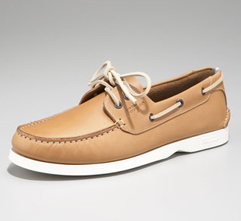 2) Check out the Sperry website to get an idea of the ranges and style available. As I said, stick with the classic for your first pair. After that, sky’s the limit. 3) Weather your Shoes: If you want your Top-Siders in the desirable “worn” phase of life, there are ways to speed up the weathering process. My dad often asks me to take his new pairs with me when I go sailing, which is hands down the best way to weather your deck shoes. If you don’t have access to a boat, you’re not out of luck. It’s an easy process to replicated on shore. Simply take the shoes and dunk in completely under water (salt water if you really want an authentic look, but make sure to rinse with fresh water before drying). Don’t worry, as long as you have a basic leather and rubber model, the shoes are designed for this kind of abuse. Once the shoes are soaked, take them out and let them dry completely in the sun. You’ll notice they’ll be very stiff at first, but will quickly soften out with wear. Sometimes one soaking is enough, or you might have to repeat the process 2-3 more times. But eventually you’ll have a nice pair of perfectly weathered Top-Siders ready for casual WASP duty anytime, anywhere. 4) Once you have your shoes purchased and weathered the last step is simple, just thrown them on and enjoy!